As an eBay hobbyist, not a power or smaller business seller, I am furious with eBay whose over-egged buyer protection policy that is supposed to protect buyers AND sellers, insist on treating my successful bidders as retail customers who are entitled to a whole raft of consumer rights they wouldn't normally have when they transact with private individuals. Whenever I sell a small item for a couple of quid or so the buyer need only issue a complaint to eBay claiming that they haven't received the item, or they did receive it but it was not as described (when neither is true), to stop my legitimately received payment from being transferred from Paypal into my private bank account. If I have already transferred the funds to my bank already, before sending out the item to them, PayPal can siphon it back and then withhold it from me in readiness to reimburse the buyer in full without my consent and without insisting that the buyer first proves on a balance of probabilities that I had defrauded them by not dispatching or sending out a mis-described item. Surely this is illegal? Even my accountant can't view, let alone raid my bank account, to forward unpaid taxes. So how come PayPal can treat my bank account as if it is their own? Apparently it's not enough for sellers (hobbyists and retailers alike) to provide proof of postage to the buyer to show that they held their end up by sending out the item in the first, which is a reasonable enough burden to prove. No, they must also take responsibility for the item reaching the buyer personally. So if a buyer took possession of the item and they decide they don't want it, PayPal will still take sellers money to refund them in full. No questions asked. e-Bay never insist that the defrauding buyer should prove that they never received the item or that the seller refused to sell or send out the item after they received payment. A court would insist that they should to win compensation from another private individual in a civil dispute. What about the law of unforeseen consequences? The postman nicked the parcel in transit, or there's a postal strike and the package got lost in the post, or the parcel was delivered to the buyer's address but it was signed off by a neighbour in the buyer's absence and they kept the package, or the buyer is not able to receive the package and the delivery docket the postman/woman shoves through the letter box is chewed up by the dog? Is that the sellers fault? Apparently it is according to eBay and PayPal, their embezzling sister arm. Should occasional sellers be responsible for delivery when they can't control post office actions, even after sellers clearly stated in their eBay listings that they are sending the goods 1st class not by special delivery or registered post intended for high value items? I think not. 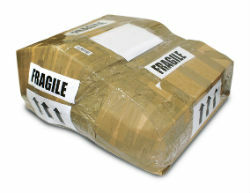 Furthermore, sellers can't send goods by securer, more expensive parcel traceable methods because the additional postage costs for special delivery or registered post would outweigh the maximum they could charge for P&P on the item and that these constraints would leave sellers with insufficient surplus P&P to cover the cost of paper wrap, jiffy bags, parcel tape, bubble wrap and so on. These things cost money, they don't grow on trees. eBay fees and PayPal transaction fees, stationery costs and now traceable higher parcel postage costs to prevent defrauding buyers from cheating sellers would simply wipe out any profit entirely. They may as well trundle down to Oxfam and dump their old stuff there. Given the number of complaints on similar issues I read, isn't it time disgruntled eBayers signed a petition to give eBay and its distortion arm PayPal one hell of a boot up the backside with a class action for general and punitive damages for withholding funds and raiding private bank accounts to extract legitimately obtained payments and also for flouting the fundamental constitutional principle that resides with all western jurisdictions that assumes that a defendant is innocent until proven guilty? I think it is. At no point did I experience Paypal doing that - older transactions maybe are not idiot proof. I just pointed out that in the start of the E-bay if buyers were taught according to the E-bay code that they were covered to certain rights at a purchase if going on and then returning the item, the money left in the Paypal could not have exited their bank account . I then pointed out that due to the lack of rights of the seller that it is possible that some of these transactions buyers are unaware that the rules have changed. Certainly it is less likely now, but back in the beginning and shortly after I remember seeing this type of transaction at seller's risk much more often. With Royal Mail, I doubt anything more than a tiny percentage goes missing. I take it with a pinch of salt. eBay Doesn't! I have just about come to the end of trying to get some one from ebay to look past their rules. I bought an Android tablet. It did not work properly. The item was replaced but sent to the wrong address, it however did not have the same features of the original item (no GPS). Now out of time for a complaint ! Chance or clever ?. The third item arrived, second hand. Quite obvious to any one with a small amount of intelligence. That was also faulty. Ebay say that I am out of time and should have made a complaint sooner. When I might ask ? I wonder how many buyers get caught out by a seller stalling for time. I agree that it seems to be the items where one has obtained them cheaply that arrived broken and without the missing pieces. One is requested to send the goods back and then the guy can fix the goods, resell and claim compensation from the Post office . Surely this is fraud? The other trick seems to be to put the wrong address. Fortunately I am known at the post office and it reaches me. I buy & sell on ebay & love it. Not ebay the company I might add, but the on-line system that allows me to sell an extending Victorian toasting fork to someone on the other side of the world. We need an honest Brit to start a new on-line selling company. A truly honest old fashioned British company that I can be proud of. No bribery, just honesty. I can understand and sympathize with honest e-Bay sellers who experience chargebacks, particularly from dis-honest buyers who cheat the system. But there are also dishonest and dodgy e-Bay sellers who also cheat the system. I am only a buyer on e-Bay, but I am getting increasingly frustrated by the ever increasing number of items that "get lost in transit." What makes me rather cynical, frustrated and angry is that the great majority of items I purchase, and which, then get "lost in transit," all seem to fall into one category. Namely, auction items (of some value) that I buy or win very cheaply! Without the protection of chargebacks, a lot more honest buyers will fall prey to the unscrupulous sharks. I guess there's always two sides to a debate. The unfortunate people who suffer the most are, sadly - the honest ones!! Forgot to add...last month I sold a woman a piece of child's clothing NWT. Forgot to put delivery confirmation on it, as it was only a $12.00 sale and it didn't seem to be worth it. WAS I WRONG! I shipped it out immediately. I know she received it. She emails me and asks if I know where her package is and asked if there was a way to trace it. To make a long story short, I tell her no, so she files an "item not received" complaint and Ebay takes the money out of my account (NO PERMISSION). I look on her seller's site and there is MY item (I know it was, because it was something that was from a few year back, same size, etc.). She had taken the tags off and marked it as LIKE NEW and was selling it in a set with other items for around $100....couldn't believe it! I called Ebay, they said they would look into it, but the next day they ruled in her favor. Oh, and she sold it for the $100.00--UNBELIEVABLE! Yes, I can't believe a class action suit has not been filed. Ebay has done all of the above to me, and it makes me sick! Really, I can't believe that they have the right to do these things. I was the victim of a chargeback by paypal, when a guy admitted he had received the item. Didn't complain about it to me. Contacted Paypal, and they shafted me. The buyer had 0 feedback. I now deal through other channels. Ebay and paypal are crooks. They don't give a damm about genuine poeple. "Someone who witnessed the birth of the net, was online on dial up bulletin boards before the net even existed"
I'm not 100% certain but I think there is some strange law that says a person does not legally have to prove they posted something to be exonerated of blame if it goes astray. I believe they only have to state that they did post it. Maybe somebody could check up on it to confirm/debunk. I seem to recall it coming up in the commercial law section of my uni. course when I did it. I have bought on ebay but not normally high value goods. I must have been lucky as I've never had any problems to date. I guess that if you go into it with your eyes open then you'll not get any surprises. "the otherhand you mention some 'what ifs' e.g. the neighbour keeps the package or it gets lost in transit. I don't think it's fair that the buyer should be left out of pocket in this situation. I make sure my items sent are covered in the event of loss and yes there is a P&P limit on some auctions but you can simply choose the 'other courier' option to make sure the costs are covered." You are kidding right? OK, I left my cardigan at a Iden pub a few weeks ago. I sent the owner a return labelled jiffy bag with stamps on it to pop it back to me. He e-mailed me to claim he'd sent it. But it never arrived. What should I do then? Ring up the pub and ask them to pop down to Marks and Spencer and buy me another one? Or refund me the money to cover a replacement? Don't be so daft. When you order stuff online you have to take some of the risk for the parcel not arriving. All the seller has to do (or should have to do is prove that they sent it to the right address (recorded delivery normally prints the postcode of the destination) and clearly state on their adverts what method of postage they are using so that buyers are forwarned about the risks they might take. If buyers enter into an agreement it is on those pre-cleared and agree terms. They can't change horses half way through the race by insisting that the seller refunds them when non-delivery of the proven sent item is beyond their control. If they are unsure about buying from sellers who post things to them, instead of wrapping them in bags to hand them over a counter, they should shop in the high street. Simple enough. Individual wardrobe and attic clearers shouldn't have to enter into a customer like relationship with buyers and buyers have no right to treat occasional junk and cast off sellers like retailers. Within any auction online or IRL there will be a percentage of people, buyers and sellers, who will be dishonest. Thats the nature of the beast. Ebay have brought in draconian policies safe in the knowledge there is no effective online competition due to people not using alternatives. The system is flawed there is no doubt of that. I for my part have had some trouble with questionable sellers, but nothing major. However it has taught me not to send expensive items or buy expensive items. A poster recently suggested compromise to me on another matter. That is how I compromise with ebay & paypal. I keep my transactions down to what I can afford to lose, with this imperfect system. I'm with you on some of the comments but not others. I do agree that the buyers can all too easily dispute an item and get their money back even when it arrives on time and in perfect condition. It's a worrying situation but so far thankfully everyone I have dealt with has been an honest and genuine person. I couldn't say the same of an experience my brother had when Paypal took over £200 back from him to refund an item he sent by fully traceable and signed for Royal Mail Special Delivery! On the otherhand you mention some 'what ifs' e.g. the neighbour keeps the package or it gets lost in transit. I don't think it's fair that the buyer should be left out of pocket in this situation. I make sure my items sent are covered in the event of loss and yes there is a P&P limit on some auctions but you can simply choose the 'other courier' option to make sure the costs are covered.